Editor’s Note: This is a repost from last year, or the year before – whatever. 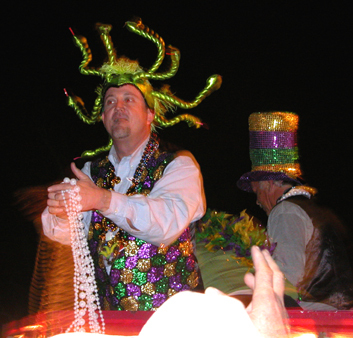 Mardi Gras is the final big blowout before the period of fasting and sacrifice called Lent. Fat Tuesday, the day before Ash Wednesday, is the end of carnival season and the final day you can indulge in those earthly pleasures we all love so much. Ash Wednesday is next Wednesday. Feel free to party as you please; here’s some music to help you on your way. Play ‘em loud, play ‘em often and play ‘em all year – make every day a Mardi Gras Day. 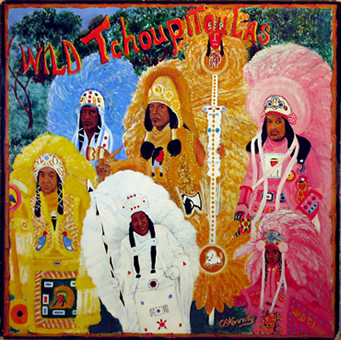 Continuing our countdown to Mardi Gras, which is this week: an album that was overlooked at the time of its release in 1976, The Wild Tchoupitoulas has nevertheless come to be considered as a landmark of New Orleans music. Not only that – it’s a great Mardi Gras party album. 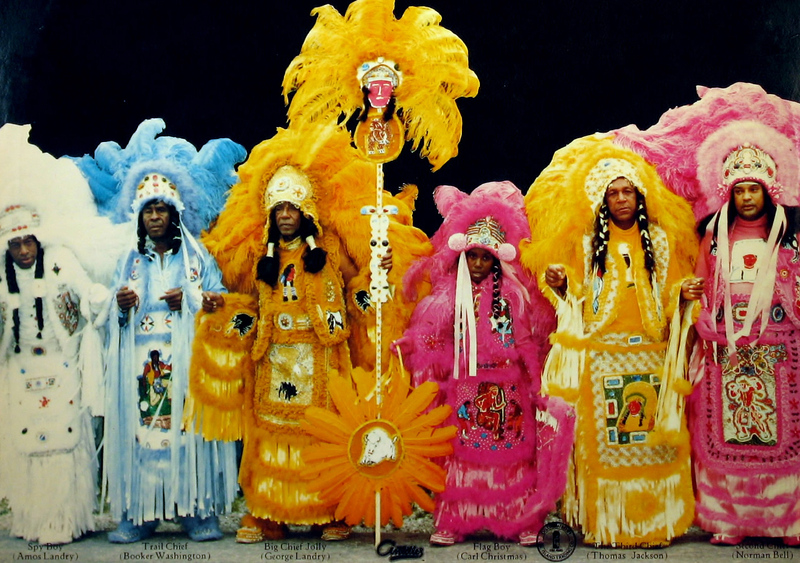 The Wild Tchoupitoulas (pronounced Choo-Pi-TOO-las) was a Thirteenth Ward street gang that put down its weapons and picked up the colorful feathery trappings of Mardi Gras Indians. A tradition dating back to the mid-19th century, the Mardi Gras Indians dressed up in a wild takeoff of Native American garb so they could get around racial segregation. When a large Caribbean population began to grow in the Crescent City that culture assimilated itself into the Mardi Gras Indian tradition. So, we have The Wild Tchoupitoulas, formed by George Landry, a.k.a. “Chief Jolly.” He had a musical background and his Indians performed a wild call-and-response routine during Mardi Gras parades. When he was approached to possibly cut an album, Jolly recruited as a producer one of the biggest names in New Orleans music – Allen Toussaint. The album kicks off with “Brother John,” the tale of a fallen gang brother, and instantly you can hear the intricate rhythms of the Meters and Art Neville’s sweet keyboard work. “Meet De Boys On The Battlefront” is an Indian “battle” cry – instead of fighting, this battle is a musical one. “Indians, Here Dey Come” and “Indian Red” are also born from Chief Jolly’s street chants; it’s worth sitting through the long first part of “Indian Red” to get to that little funked-up part about five minutes, 40 seconds in. Toussaint puts in a ringer, “Hey Pocky-A-Way,” which was a hit of sorts for the Meters in 1974. This version is a little looser than the original, and it features on background vocals the Brothers Neville harmonizing together for the first time. When The Wild Tchoupitoulas was released it wasn’t a hit (except in New Orleans, of course) but it did inspire the Nevilles to perform together as a brother act. Hence, the Neville Brothers – and when they released their second album in 1981 (the stone classic Fiyo On The Bayou), they kicked it off with a rockin’ version of “Hey Pocky-A-Way” and dedicated it to George “Big Chief Jolly” Landry, who died in 1980. The Neville Brothers and the Meters continue to be active, and every time one of these units takes a stage it’s a reminder that they deserve more than just about anyone else to be enshrined in the Rock and Roll Hall of Fame. Forget Mardi Gras – any time of the year, this is essential American music. Not much to say today: it’s Fat Tuesday/Mardi Gras day, and it’s the final big blowout before the period of fasting and sacrifice called Lent. Feel free to party as you please; here’s some music to help you on your way. Play ’em loud, play ’em often, and play ’em all year – make every day a Mardi Gras Day. Thanks to L.A. correspondent Randy Fuller for his contributions to this post. Walkin’ To New Orleans: Let’s Go To The Mardi Gras! Mardi Gras is a party for the best of reasons: to have a party. Catholics say it’s to get all the deviltry and mischief out of your system before Lent sets in but if you go to New Orleans you get the impression most of these partygoers aren’t worried about sinning, church and stuff like that. At Mardi Gras, you drink a lot. You stand around to yell and grovel for someone to toss you cheap colored beads and worthless coins. You drink some more. Women walk up to you and lift up their shirts, and their breasts are painted like big eyeballs. Prostitutes hit on you, transvestites hit on you, middle-aged male tourists from Des Moines hit on you. You need to drink some more. So, as a public service, on the other side of the jump we give you the official 30 Days Out Mardi Gras Party Kit.